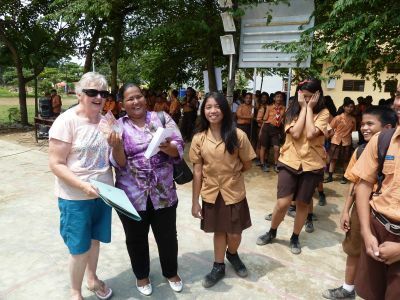 Below are some quotes from people who have visited our projects in Indonesia, and from some of our supporters. 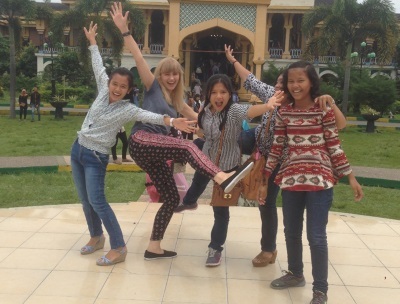 We had an amazing trip to Indonesia, we saw God at work, learnt a lot, and found it very emotional. It far out passed our expectations and has changed us. 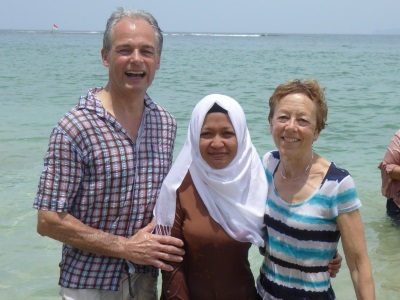 Meeting our sponsored children in Banda Aceh after 12 years was the highlight of our visit, but there were many more memories, including playing in the sea with many of the orphaned children and their guardians. The generosity we received from these very poor people was a humbling experience; extending hospitality to us westerners was important to them. 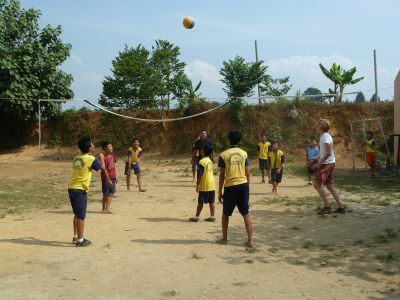 It has been a privilege to spend time with so many of the children supported through BEATS. The sponsorship programme gives the children a feeling of being cared for by an adult outside the children’s home or their ‘foster family’. Seeing their enthusiastic response on receiving a letter from their sponsor was real evidence of the affection they have for them. 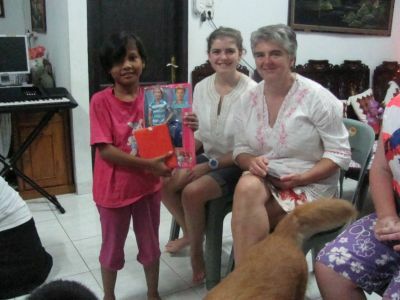 The joy and happiness in the two children’s homes; YACAN and YASAH is tangible and their strong Christian faith reflects in all they do, whether playing together, carrying out their daily duties and even studying. Something that stood out about my visit to Indonesia was how, wherever I found myself, I was always welcomed with open hearts and kindness. I thoroughly enjoyed my time there and would encourage anyone who is thinking of doing something similar to go ahead and do it! It will be one of the best eye-opening experiences of your life. Share their faith and the joy of being together. It has been such a privilege to spend time with them and to be a part of their lives. Amazed how happy they all are with so little possessions and a tough life. Frustration that I could not do more (wave a magic wand!). Shocked by what some of these children have coped with in their short lives. Happy because they have Sarah, Pak Ndraha, Mena and all the lovely teachers and carers in their lives and that there is hope for their future with all the love and support they have. This was the most amazing trip I have ever been on. Apart from seeing first-hand the effects of the Boxing Day tsunami in the museum and sights of Banda Aceh, it was so lovely to meet such friendly, welcoming and loving people. 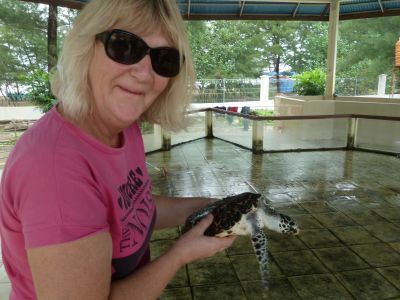 It’s so important to see the workings and results of any charity programme, although often not practical for many to do so, and here in Indonesia I experienced everything one could wish for. The children and staff are so wonderful, so full of joy and hope despite their experiences, so grateful for anything that is done for them and both children’s homes, YACAN and YASAH, are filled with a love that is tangible and embraces all. I learnt so much and received so much love I felt both proud to be part of it but also humbled by their openness, gratitude, acceptance of what life brings and hopes for their future. 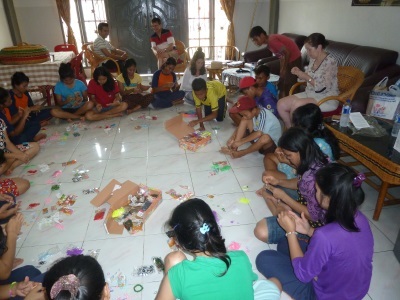 If you want to grow your faith, visit YASAH and YACAN orphanages in Indonesia. In YASAH to wake at 5 a.m. to the sound of children singing worship songs, rising, no, soaring, from the centre of the square building which is open to the sky and to live in the love and care of this large family. In YACAN, a lovely smaller mirror image of YASAH, a close family of mainly unrelated children of 6 to 21 year olds, who love and look after each other, secure, nurtured and trained up in righteousness and all these children being encouraged to be ambitious for their future. The children and staff were some of the friendliest and most humbling people that I've ever come across, and I have witnessed first-hand the amazing work of BEATS. 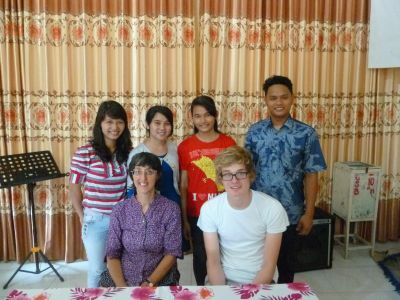 I thoroughly enjoyed my time at YASAH and YACAN, and I hope that my trip to Indonesia will be the first of many! The first university student to graduate said: "Thank you for the many years you have sponsored me, so that I can arrive at where I am now. Although I cannot repay all you have given, I am sure God will repay it." "It's my last day in Indonesia today. I am really sad to leave this beautiful country and these amazingly friendly people!" 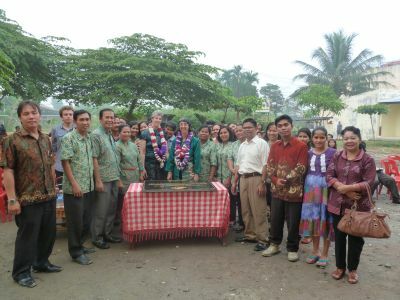 The picture (right) shows Ian with some of the sponsored teachers, holding letters from their sponsors. 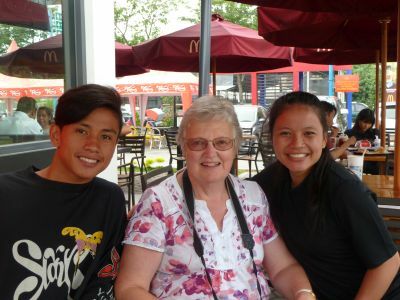 Joey said:"The children are incredible and I have learnt many lessons from them. They approach everything with tons of passion and excitement, treating chores like hobbies and hobbies like they are living the dream. 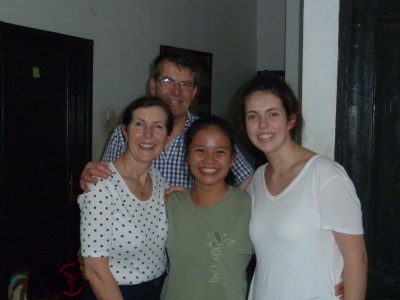 Pak Ndraha and his family are some of the most humble people I have ever met; they are fantastic role models to everybody here and wonderful hosts." Yingli said:>"Even though we only stayed in YACAN for three days, I felt being part of the family ever since the first day we arrived. We could not communicate very much in detail, as we speak different languages; but I always feel their over-pouring love for us. We barely knew each other, where is this passionate love from?"